These are just a few of the questions that author Kayt Sukel tackles, applying the latest research in neuroscience and psychology to compelling real-world situations. Building on a portfolio of work that has appeared in such publications as Scientific American, Atlantic Monthly, The Washington Post, and more, Sukel offers an in-depth look at risk-taking and its role in the many facets of life that resonates on a personal level. 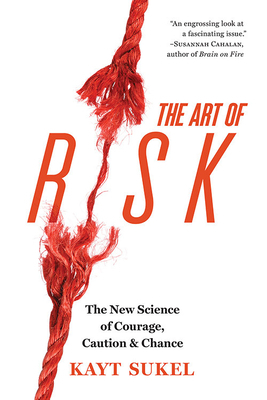 Smart, progressive, and truly enlightening, The Art of Risk blends riveting case studies and hard-hitting science to explore risk-taking and how it impacts decision-making in work, play, love, and life, providing insight in understanding individual behavior and furthering personal success. Kayt Sukel earned a BS in cognitive psychology from Carnegie Mellon University and a MS in engineering psychology from the Georgia Institute of Technology. A passionate traveler and science writer, her work has appeared in the Atlantic Monthly, the New Scientist, USA Today, The Washington Post, ISLANDS, Parenting, the Bark, American Baby, and the AARP Bulletin. She is a partner at the award-winning family travel website Travel Savvy Mom (www.travelsavvymom.com), and is also a frequent contributor to the Dana Foundation's many science publications (www.dana.org). Much of her work can be found on her website, www.kaytsukel.com, including stories about out-of-body experiences, computer models of schizophrenia, and exotic travel with young children. She lives outside Houston and frequently overshares on Twitter as @kaytsukel. "Cultural scientist Kayt Sukel breaks down why aggressive entrepreneurs are as thoughtful, if notmore thoughtful, than more conservative businesspeople, and how smart risktaking is both importantand necessary to succeed in career and in life." "Interesting for both the science and the personal stories, this thoughtful book will prompt a range of readers to reexamine their lives and motives." "The author is a blithe and personable guide to risk-taking, sharing her own experiences and getting research scientists to open up about their findings."